Feature Remember when the internet was young, moving your bulky monitor was a two-person job and 1.4MB disks didn't look like a typo? Back then (most) people didn't have to choose which web search engine they were going to use: it came prepared by the operating system maker, such as Microsoft and MSN Search, or the folks you got your broadband from, like AOL Search. These days many still aren't looking very far for a search engine: Google remains dominant, but an aberrant few are into Bing, Baidu, Yahoo! and Ask.com. 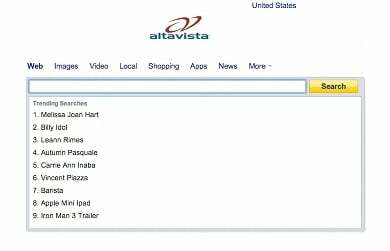 Ask folks to name an old search engine, and AltaVista is the one that springs most readily to mind. It was created by researchers Paul Flaherty, Louis Monier and Michael Burrows at the once mighty Digital Equipment Corporation, or DEC, as a way to retrieve files from the public network more easily. 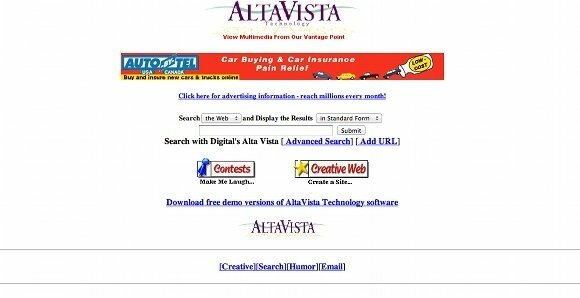 AltaVista was launched for everyone else's use in 1995 and immediately took off. Monier's web crawler was fast and multi-threaded and could cover a lot more web pages than other engines using advanced DEC hardware, making it the first full-text database of the net. A year later, AltaVista was providing Yahoo! 's search results and getting millions of hits every day, but like most of the old guard, its popularity was going to be short lived. DEC was snapped up by Compaq in 1998 and the following year Compaq redesigned the once clean interface to a portal, much like Yahoo! 's, with shopping, email and other stuff provided. In 1999, a majority stake in the engine was gobbled by CMGI, an internet investment biz, which was hoping to float AltaVista on the stock market in April 2000. But by then it was all too late: the internet bubble popped, the IPO was abandoned and the site started losing market share to an uncomplicated Google. By 2003, AltaVista had cleaned up its front page and was bought by Overture Services, a sponsored search firm, which in turn got eaten by Yahoo! and renamed Yahoo! Search Marketing. AltaVista bowed out as a separate entity in 2011. The site survives but searches are handled by Yahoo! Paul Flaherty went on to work as a corporate strategist and management consultant. He died of a heart attack at the age of 42 in 2006. Louis Monier worked at eBay after AltaVista and then at Google until 2007. He left Google for another search engine Cuil, but that move turned into a dead end. He jumped Cuil's ship after just one month due to differences with the CEO. He then co-founded Qwiki, a website that pulls together interactive presentations of text, video and photographs when users search for information on a particular topic. Monier is the chief scientist of Proximic, which provides real-time data for online advertisers and agencies. Michael Burrows, a British computer scientist, created the Burrows-Wheeler transform, an algorithm used in data compression. From AltaVista, Burrows went briefly to Microsoft before joining Google.